An observation about tomorrow's Gospel lesson, Luke 1:39-56, which speaks of Mary's encounter with Elizabeth in the Judean countryside. Both women are pregnant: Elizabeth, past menopause, is bearing her son John the Baptizer; Mary, a virgin, bears Jesus, God "in human flesh appearing." When Elizabeth greets Mary, she is able to identify the Child in Mary's womb as the Savior and to call Mary blessed for being the theotokos (the bearer of God in her womb) by the power of the Holy Spirit. Elizabeth is the only member of her family who can give witness to what's happening. Zechariah, her husband, has been struck mute by the angel who told him that Elizabeth would give birth to a special son; his muteness confirmed for the old man that all that had been prophesied was true and that his son would be the forerunner preparing the way for the coming of Jesus. John the Baptizer is still in his mother's womb. But neither John nor Zechariah, though among the living, can speak. Zechariah gestures. John the Baptizer leaps for joy. It's up to Elizabeth, led by the Holy Spirit, to verbally articulate the family's faith in the God Who was now definitively acting to fulfill His promises for a Savior. Matthew tells us that when Joseph, Mary's fiance, was first told of Mary's pregnancy, he didn't believe it. He believed that she'd had sexual relations with another man. 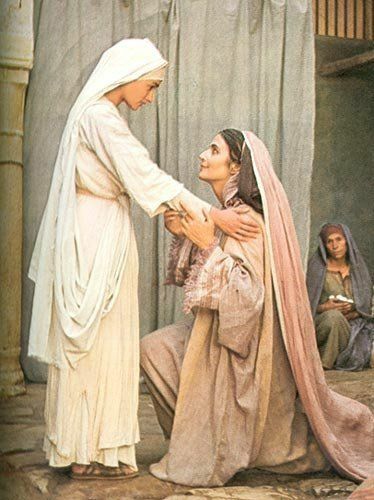 Only the intervention of a vision from God persuaded him that Mary was telling the truth, that she was a virgin and that the Child conceived in her womb was from the Holy Spirit. The point is that from the beginning of Jesus' invasion into this sin-darkened world, it was women who believed and proclaimed the truth that this Jesus was (and is) the Messiah, the Christ, the Lord's anointed, "the Word made flesh." And it was to women that God first revealed that Jesus had risen from the dead. It was to the same women who had gone to Jesus' tomb to anoint His body that God first entrusted the Easter message: the good news that God the Son, Who had sacrificed Himself on the cross for human sin, despite His own sinlessness, had now overcome death and was alive again, able to give this same victory over death to all who trust in Him. So, I grow impatient with those who say that the Holy Spirit couldn't possibly call women to ministries of Word and Sacrament. It's there in the Gospels: While men were mute, disbelieving, or fearful, women faithfully, boldly, and joyfully responded to the Holy Spirit and to Jesus Christ, then proclaimed Jesus as Lord. How dare any segment of Christ's Church stand in the way of women doing what God the Holy Spirit ordains? There are more Biblical arguments for the ordination of women to the ministry of Word and Sacrament than this, of course. But here, in a salvo of joy, we meet one such argument, I think, in the narrative of what the Church has historically called, the Visitation. The theme for this Third Sunday of Advent is Joy. And there may be no better Old Testament lesson to focus us on this theme than Zephaniah 3:14-20. The passage is chock-full of joy, brimming with joy, running over with joy! It begins with the prophet calling the people of God to sing and shout with joy in anticipation of the fulfillment of the promises that God was giving to them, promises God was giving to them despite their past idolatries and other sins. And it culminates with the joy all of God’s people will experience when God brings them home to Him. Joy fills every word of this lesson! What’s all this joy about anyway? To answer that question, a little background is needed. Zephaniah prophesied during the reign of Josiah, who became the king of Judah as a boy and went on to become one of Judah’s greatest kings, not because of his military prowess, but because of his faithfulness to God. Josiah instituted reforms in Judah that encouraged the people to turn back to God. Josiah did this after he’d become a man and taken control of the kingdom. And some people believe, Josiah was encouraged in these reforms by prophets like Zephaniah. But when Zephaniah began prophesying somewhere around 640 BC, Judah was mired in idol worship of all kinds. And, as always happens when people turn to anything or anyone other than god to be of ultimate importance in their lives, sin became rife among God’s people. They were prosperous but refused to acknowledge that their ability to amass wealth came from God. They were unjust to the very people God says His people are to treat with love and care--viewing them in Martin Luther’s phrase “like little Christs”: widows, orphans, the poor, the lame, the migrant. Because the people of Judah were descendants of Abraham and Sarah, they thought they were safe from God’s condemnation for their sins, just as today, some Christians figure they’re good with God simply because they’re baptized and confirmed and have a place on some congregation’s roster, even though they refuse to live in their baptismal covenants and make gods of themselves, or their money, or their status, or their pleasure. Judah wasn’t the only nation that God warned of His impending punishment for constant, unrepentant sin through Zephaniah. If we insist on unrepentantly violating God’s will--failing to trust in God, failing to love our neighbor, there are consequences. “The wages of sin is death,” Paul reminds us in Romans 6:23. God sent prophets like Zephaniah to call all the people of the world to turn to Him and live (Isaiah 45:22, Joel 2:12, Zechariah 1:3, Amos 5:4). When we turn to the God now revealed to we non-Jews (we Gentiles) as well as to Jews through Jesus Christ, it doesn’t mean that all the bad stuff of this world will go away. But there will still be reason for joy. Take a look at our lesson then, Zephaniah 3:14-20. (1) Here, Zephaniah speaks to his own people in the seventh-century BC who were looking for a Messiah Who would bring forgiveness of sins and restoration. (2) He speaks also to the New Testament Church which witnessed Jesus the Messiah’s death for human sin and His resurrection bringing forgiveness and new life to all who believe in Jesus. But that first-century church still waited, often impatiently, for the final restoration of God’s reign over His people on Jesus’ return. We might have reason to doubt that promise if it weren’t for Jesus. When “the Word,” God the Son, “became flesh and lived among us,” He demonstrated the lengths God is willing to go to be with us. When God the Son, truly God, became simultaneously, truly human, He was born in a cave kept for cattle. Jesus lived a perfect, sinless life beyond condemnation. Yet the whole world, Jews and Gentiles, condemned Him, beating Him savagely, nailing Him to a cross, and watching while He suffered and died. God has drunk from the cup of human experience and human suffering to the full. Jesus’ life and death is the guarantee that God’s promise to be with us is the most reliable promise we can receive, one Jesus reiterated following His resurrection and before His ascension, He told His disciples, including you and me, “I am with you always even to the close of the age” (Matthew 28:20). In Jesus, God saves us from sin, death, futility. He saves us from shame and self-recrimination. He saves us from worry over our eternal destiny. He saves us from the arrogance, pride, and thoughtlessness that lead us away from God into the very sins that caused Judah so much pain and cause so much pain even today. As you’ve heard me before, Jesus, above all, saves us from ourselves! Without Him, we are lost, as a funeral with any unbelieving family will prove. Did you notice the change of narrators? In the first part of the lesspm, Zephaniah speaks on behalf of God, conveying God’s promises to those who turn from sin and turn to Him for life. But here, God speaks to us personally, intimately. He speaks to you. And He gives seven promises. God promises He will: remove the sorrow over our idolatries; deal with all who have hurt us (dealing with them is His job, not ours, after all); rescue the lame; give dignity and a place with Him to those who have trusted in Him; gather us to Himself; bring us home (remember that Jesus says that He has gone to prepare a place for us with God); and restore our fortunes, by which I think God means He will restore to us our intended places as heirs of His grace, just like the father in Jesus’ parable of the prodigal son. It’s to make all of this possible that Jesus was born at Christmas. We sing, we sing, in joy made full!